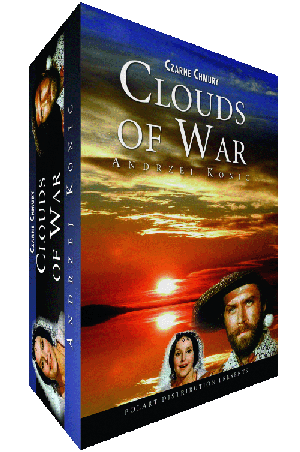 "Czarne Chmury" is a 10-episode Polish television show set in the 17th century. I thought the series was filled with exciting duels and horse chase scenes, and some occasional humor as well. To top it off, I thought the series had some of the most dramatic music I have ever heard. In effect, it is like a soap opera as most episodes end with a cliffhanger to keep the viewers in suspense for the next episode. Furthermore, the details and characters are tied together throughout the series. At the start of each episode there is a recap of the past events to refresh your memory or to help those that start watching from somewhere in the middle of the series. If you enjoyed "Pan Wolodyjowski," then you will probably love "Czarne Chmury." By and large, the costumes and effects are comparable or slightly better than "Pan Wolodyjowski." I found the series to be very enjoyable and entertaining, regardless of the weak special effects, due to the age of this 1973 TV-Series. The most prominent distinctions between the two is that "Czarne Chmury" involves Prussia and is considerably longer, running over 500 minutes. If you enjoy historical films filled with adventure, then look no further.